Totally tried to get this up yesterday but it just didn’t happen for me. Too much fun this weekend made for a SLEEPY Monday. 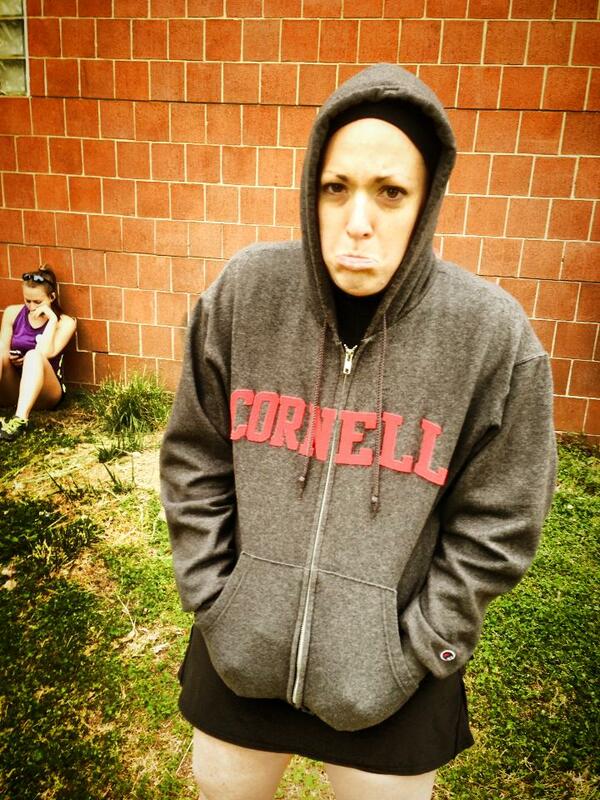 Also, it’s raining and cold here which doesn’t facilitate getting pumped up for a Monday. 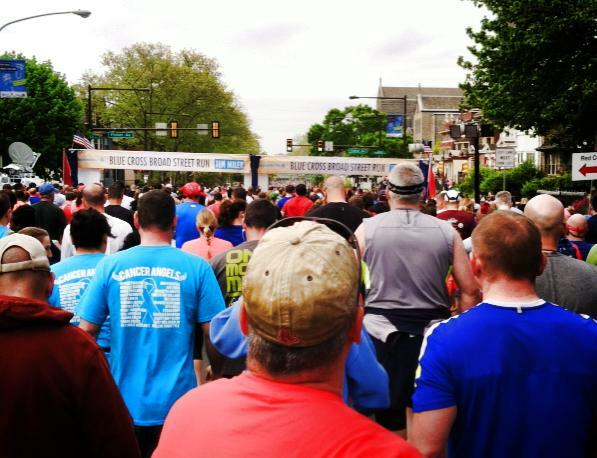 This weekend Mike and I participated in the Broad Street Run in Philadelphia. 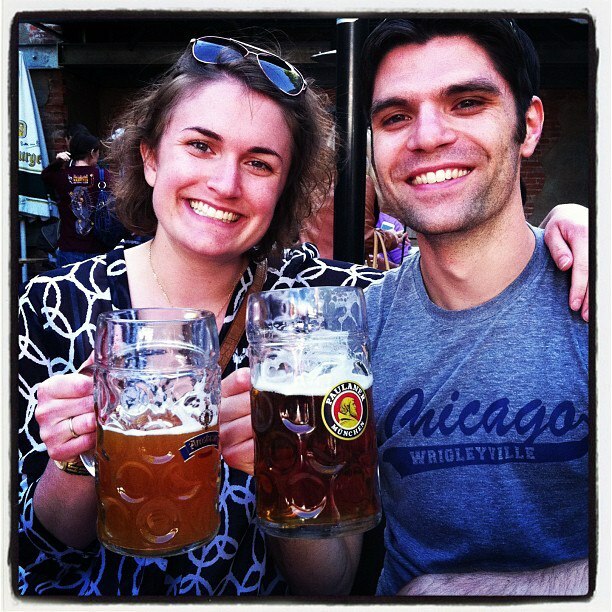 I jump at the chance to run races in Philly because that is where my best-friend and lady-life partner Sarah lives. Over the past three years of her living in Philly and me in DC, we’ve gotten really good at making the trip and I feel like her friends in Philly are my friends now too! Friday night, we made the trip up I-95N. Saturday included breakfast at Schlesinger’s, a good stretch out at Philly Power Yoga (post coming later this week), a trip down to Lincoln Financial Field to get our race packets, watching the Derby on South Street, and dinner on Rittenhouse Square. Also, Juno was on TV. Whoot whoot! Sunday was, of course, RACE DAY. Here’s how it went. The race didn’t start until 8:30 pm but you had to take the Broad Street Line subway to get to the start. Races that involve taking public transportation make me nervous (I had an almost calamity at the Baltimore Half Marathon) so we were up and on a train at 6:15 am. We arrived at about 6:40 and then just waited around for almost two hours, which was not my favorite part. Add to that… it was FREEZING and WINDY. Also, they claimed that bag check closed at 8:00 am so I had to part with my warm layers (I should have just done throwaway clothes) for a whole 30 minutes before race start. The starting area was CROWDED. Huge lines everywhere, massive crowds trying to move around, and people were getting restless / feisty. It wasn’t my most pleasant pre-race experience. At one point, I was trying to get to my corral and I just stood, stuck in a massive, unmoving crowd for legitimately 15 minutes. I never actually made it to my corral. I saw a break in the fence and just hopped in. The corrals were not being strictly enforced at all anyways, and I was getting cranky so I needed to RUN. Mercifully, I finally crossed the starting line and got going. However, at that exact moment the clouds broke and the sun starting beating down hard. By mile one, I was baking in my long sleeved jacket. I knew I was going to be miserable if I kept it on so I pulled over for a quick minute to remove my layer (I was wearing a tank top underneath), quickly re situate, and get back on the road. I ended up losing about a minute and a half of time, which is fine but kind of annoying. The race course and the crowd support was EXCELLENT. You start all the way up Broad street in North Philly and run a straight shot down Broad, around City Hall, through Center City, and down to the Navy Yard in South Philly. You know how some days are just great running days? This was not one of those days. My legs just felt tired pretty much the whole race. I was holding a great pace but it felt tough. By mile 5, I was getting tired and I thought to myself “Uh oh, I still have 5 miles to go and I’m already tired.” When I start getting tired during a race, I try and use my ego to my own advantage. I stuck to the outside of the course, so I wouldn’t be tempted to walk in front of all the spectators. Hey, whatever you gotta do right? Coming around City Hall was awesome and I knew that my friends would be on Broad between City Hall and South Street. I saw Sarah (and gave her a high five) but missed Kristy (womp womp). Then it was another ~ 4 miles to go. I was on pace to meet my 10 mile PR from December and, even though I was tired and my knee was starting to hurt a little, I was not going to let up. I kicked it into high gear for the last half a mile and flew to the finish line. Unfortunately, there was a HUGE backup of people at the finish line, so I was forced to stop completely 1 step across the finish line. Not ideal. I clicked off my watch and didn’t even look at it while I tried to navigate this massive clog of people. When I finally got funneled into the finish area and looked at my watch, I realized that I set a new PR by 4 seconds! 1:31:47 by my clock. However, this is an unofficial PR since my chip time was a 90 seconds longer thanks to my stop to change my shirt. Irritating, but that’s ok. I’ll keep my PR from December for now but I am gunning for a sub 1:30 10 miler this Fall. In summation: Broad Street was super fun and energetic! You really get a taste of Philly and that rocks. Logistically, this race is challenging because of the huge crowds and small start / finish areas. I’m so glad we did it and maybe we will in a few years, but not next year. 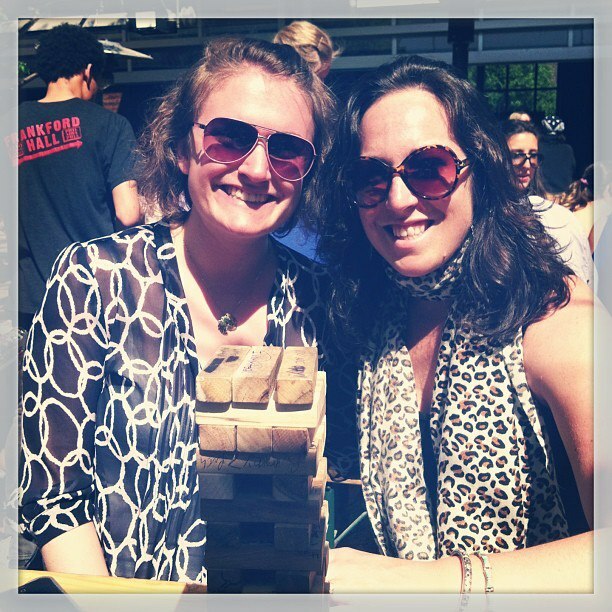 After bagels and showers back at Sarah’s, we cabbed up to the Northern Liberties for a post race celebration of beer, jenga, and ping pong at Frankford Hall. I wasn’t feeling 100% (I got an exercise induced headache after the race) so I stuck to soda and agreed to be our designated driver. I didn’t mind at all, we had so much fun! By 7 pm, Mike and I were on the road back to DC. We hated to leave Philly (and Sarah) but we’ll be back again VERY soon! Have you ever run Broad Street? What did you think? Yesterday ended up being just one of those days that got away from me! I feel like I blinked and it was 10:45 pm and I was crawling into bed exhausted. It also didn’t help that I had my eyes refracted at the eye doctor at 10:30 am and spent most of the middle of the day in a blurry fog trying to work without actually being able to see… that was funny! Anyways… here’s my recap of the Surf-n-Santa 10 Miler! We arrived in Virginia Beach SUPER early on Saturday morning. Driving down after work on Friday night meant we missed the expo on Friday night (no new Hippie Runner headbands for me… wahh). We needed to get our numbers still so we arrived right when it opened at 6:30 am. We were done by 6:33 am… soooo we had lots of time to kill. Mike had not actually run at all since the Philly Marathon because first he hurt his foot and then he got horribly sick. Poor guy was not doing well! He still wanted to run, so we decided to just run together since my pace is very easy for him. We had decided to do 9:30 min / miles for a time of 1:35. The weather was kinda yucky that day… very overcast and humid. But the temperature was really comfortable milling about at the starting line. Mike was assigned for corral 1, but he lined up with me in Corral 2. We were actually right at the front of our corral, which initially made me nervous. I kept thinking to myself “I don’t belong here in the front of the second corral… this is for real runners.” But then I realized that my number was right at the cut off for corral 1 and 2… I was ALMOST assigned to Corral 1… whhhaattt?? I decided to face my fear of being in the front of the pack. Also How cute are people’s costumes? The course bikers were all dressed up like the Grinch! Before I knew it, we were off and running. I just wanted to run and have some fun. As I mentioned… I didn’t think this was going to be a PR day. Virginia Beach in December is a ghost town, so there wasn’t much to focus on but running with Mike, chatting, and taking in everyone’s funny costumes. The 5K and 10 Miler started together and basically did 3 miles together before the 10 milers went out for another 7. At the 10M and 5K split they had these adorable people in gingerbread suits… HOW CUTE. Here’s how my race went. Miles 3.1 – 5: I started getting this idea in my head that maybe a new PR wasn’t so impossible after all. My previous PR pace was 9:15 min / miles and I was well under that right now. But then I started doubting myself. I set my 10 Miler PR 6 days before I ran my first marathon. I was in phenomenal shape at that point (if I do say so myself). I was only at the beginning of my marathon training this time and had not been running / training to the same level. I decided to put the PR in the back of my mind and make a decision at mile 5. 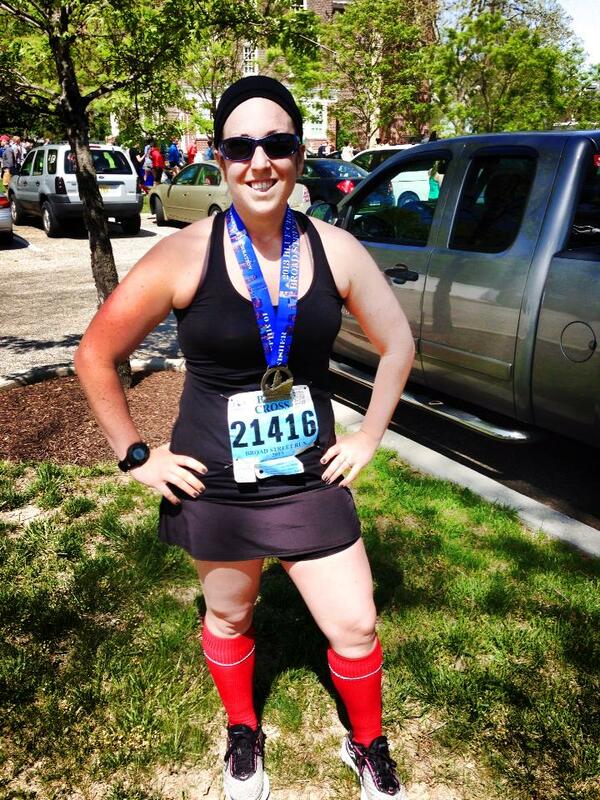 Miles 5 – 6: I decided to go for it! I asked Mike to pace me in for time around the 1:31 range. He happily obliged! We made the turn to head down the boardwalk, which was a long (approx 2 miles) straight away. I also set a 10K PR of 57:15… where was this all coming from??? Maybe I need to seriously start thinking about shorter races more? Miles 7-9: I really battled these. I was really pushing myself, but I was feeling good. My legs felt awesome, though I was starting to feel a dull ache in my left hip. That was pretty standard for me though… I knew I could push through that. Unfortunately, I started to doubt that I could pull this thing out. I was holding a 9:05 pace according to our watches and it was starting to hurt. I remember thinking to myself “I need to slow down I can’t hold this pace” but then I realized the only reason I thought that was because I was scared. Yeah I was working hard but I was more than capable of handling it. I was gonna do this… even if I killed me. I did have to slow down at one point to around 9:20 because I caught a huge whiff of cigarette smoke from a spectator and almost threw up all over my awesome orange sneakers! Mike was amazing during these miles. He just kept encouraging me and telling me how amazing I was doing. In the back of my mind were two thoughts 1) I need to do this because the pain of doing it will be nothing compared to how disappointed I will feel if I give up, and 2) Mike is going to be so proud of me when we do this together… that alone will be worth it! Mile 10: Out of nowhere… I busted out an 8:30 mile. Um… I’m sorry, can you repeat that? Yes… an 8:30 FINAL mile in a 10 miler. I’ll be honest, I felt like hell during this mile. I barely said a word (and if you know me you know that is NOT normal) Mike would just be saying encouraging things and I would kind of grunt in agreement. Literally .1 miles from the finish line, I was just like I CANNOT DO THIS I WANT TO DIE. But Mike was there to push me over the finish line for a 1:31:51 (official) finishing time. Ignore my “current speed” I clicked off my Garmin after I stopped … so it’s all high and not awesome like my race was! I’ll say it over and over and over… I’m so grateful for Mike. I don’t know if I could’ve done this without him. He sacrificed his own race to help me achieve a new goal too, which is a perfect example of how selfless he is. He kept saying that he was having a hard time keeping up with me (so yay! 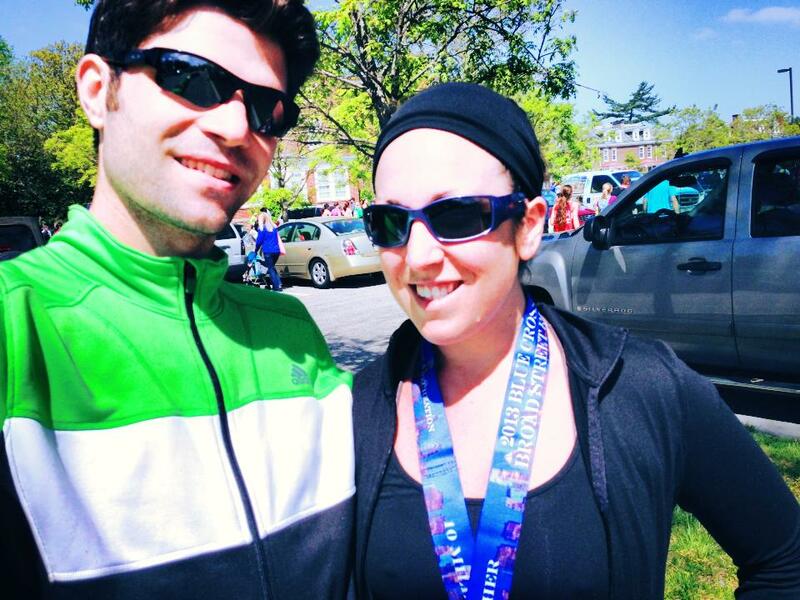 I’m fast when Mike has rested for 3 weeks post-marathon and has the flu… SUPER RUNNER!) But he’s is amazing and I just wanted to melt into a puddle of loving goo because I was so happy. But in all seriousness… this race was not just a PR. I won a lot of mental battles here too. I don’t think I have ever really pushed myself that hard. I normally don’t like that feeling, but this race made me realize that it’s ok for it to hurt. I embraced the pain. I realized… I’ve been running scared for most of the last two years. How good could I get if I let go of my emotional and mental baggage, and just let the athlete in my come through? Mike uses this amazing race mantra I wanted to share. “The first third of the race, find your rhythm The second third of the race, sharpen your focus. The final third of the race, unleash the monster”. Tomorrow I’m running the Surf-n-Santa 10 Miler in Virginia Beach!! Hitting the road tonight and staying with one of Mike’s grad school buddies who has graciously offered to let us stay at his brand spankin new house! I’m really psyched about this race but wanted to spend some time getting ready for it mentally and physically. 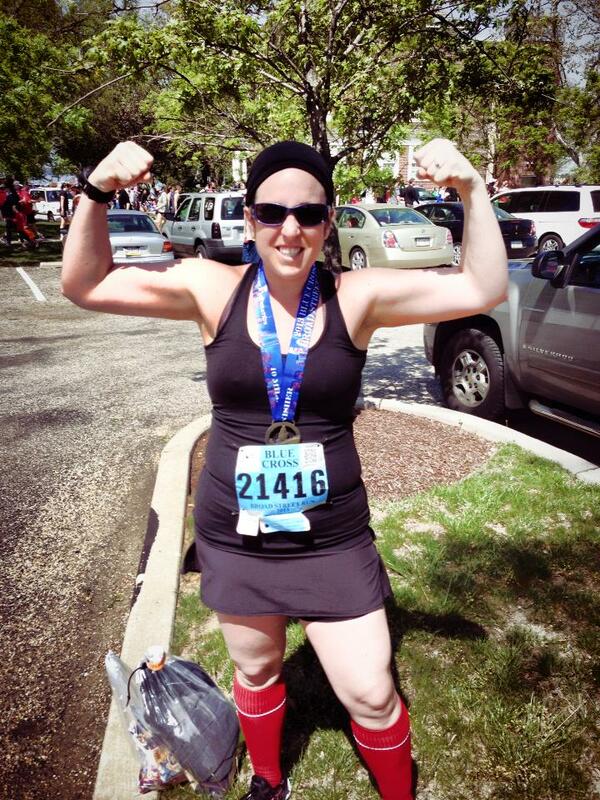 I felt completely unprepared for the Philly Half even though I obviously finished and did fine. We were planning the weekend in Philly followed by a whole week away with my family for Thanksgiving. Mike was traveling for work and preparing for a marathon. I needed to find a cat sitter and figure out why Comcast wanted $313 from me… the week was insane. I got to Philly and realized I had not prepared for the race AT ALL. I didn’t look up my bib number, I didn’t even look up where the expo was. I brought no fuel with me and didn’t buy any at the expo. Then we got food poisoning and Mike was worried about his ankle injury. Basically, Philly wasn’t about me. It was about Mike and I was fine for it to be that way. But this time I wanted to be READY, because nothing makes me more crazy cakes than not being prepared. I spent some time yesterday reading the event website, familiarizing myself with the details, and looking at the course. Luckily, a beach race can be counted on to be one thing… FLAT. Woot woot. 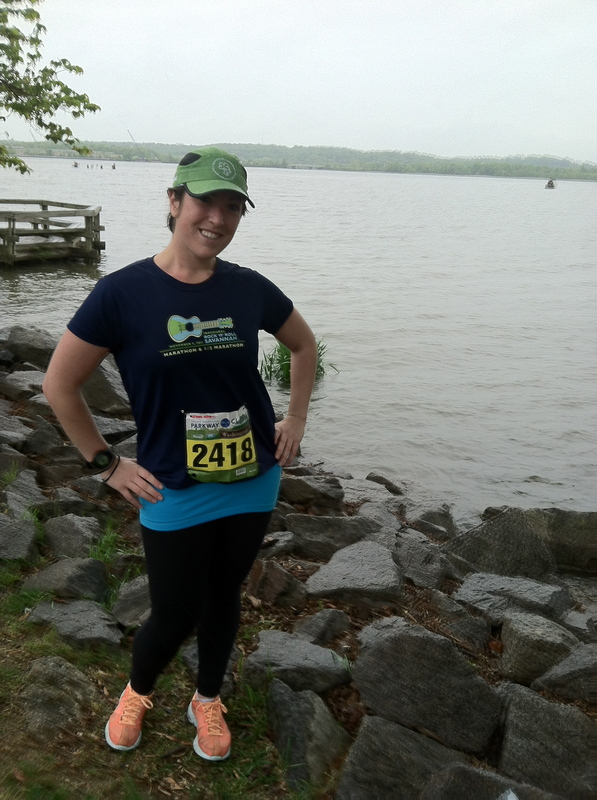 I set my half marathon PR in Virginia Beach last Spring actually! I don’t think tomorrow is going to be a PR day (My 10 Miler PR is 1:32 from the George Washington Parkway Classic… pictured below) but I’d like to shoot for under 1:40, which I think is very doable. If that doesn’t happen though, I really won’t be sad. I am training for a marathon right now so I have to remember that is my ultimate goal! 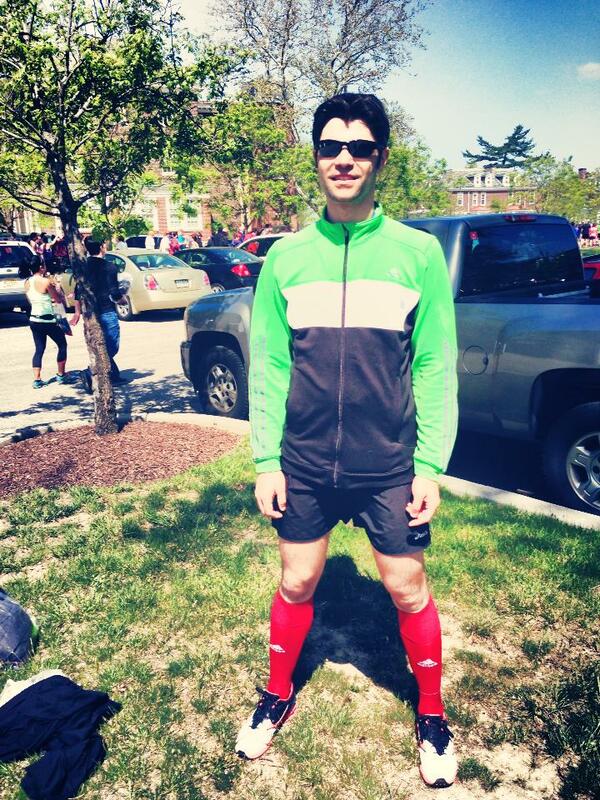 This is also a REALLY fun race because they encourage people to dress up! I put together my most “Christmas-y” outfit last night which includes black capris (duh), optional black calf sleeves (want to see how cold it is), my red tech tee from the Country Music Marathon, a white tank, green and white striped arm sleeves, and a green sparkly headband (I am wearing both in the picture below). Everyone gets a Santa hat but I wasn’t sure if that was before or after the race? I have one that I might throw in my suitcase just in case! You also get jingle bells. This past Sunday, Mike and I are ran the George Washington Parkway Classic 10 – Miler sponsored by Pacers. If you live in the DC area I seriously suggest checking out / participating in any of the Pacers racing events. They are always extremely well organized, which I hold paramount in racing. This weekend’s race was held on the ten mile stretch of the George Washington Parkway from Mount Vernon to Old Town, Alexandria. 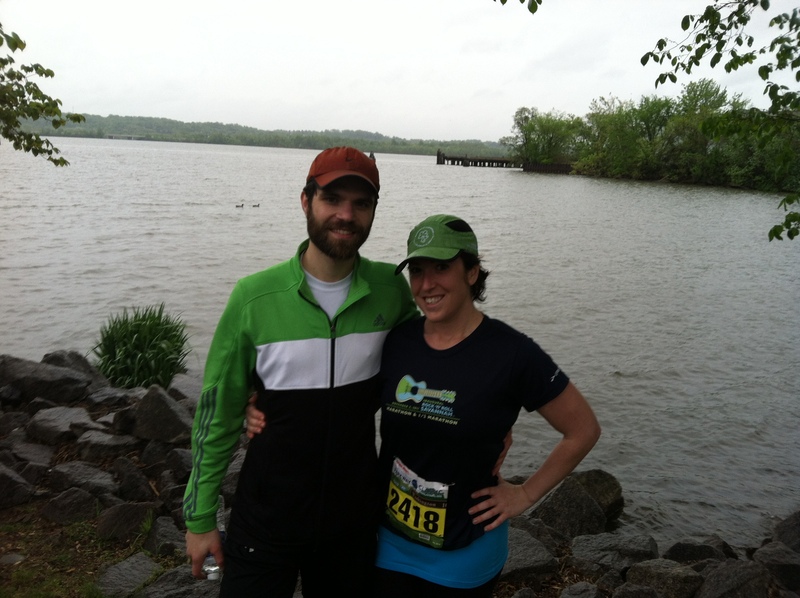 The course was GORGEOUS – through the trees / suburbs outside DC with views of the Potomac River. It was also pretty challenging! While the point-to-point course had a net downhill grade, the rolling hills still proved a fun challenge. 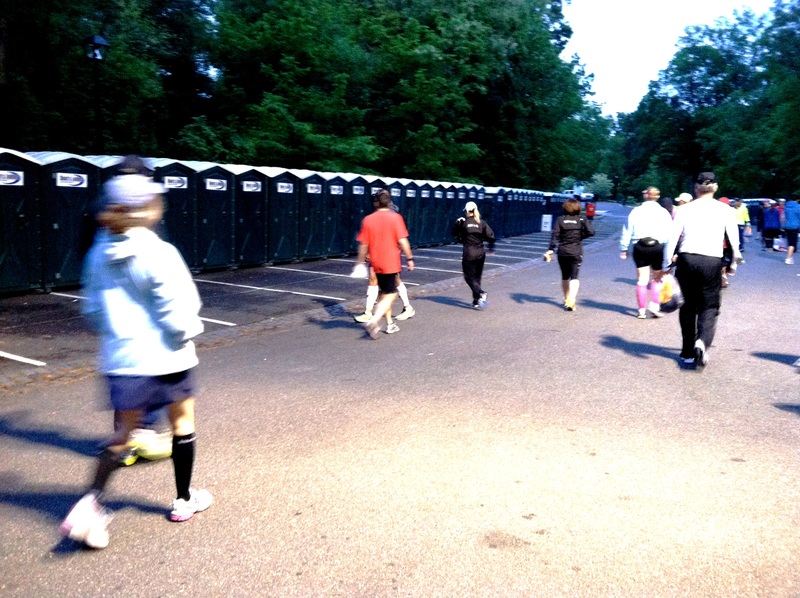 PLENTY of bathrooms… lines were amazingly short even right before the race. CHA CHING. 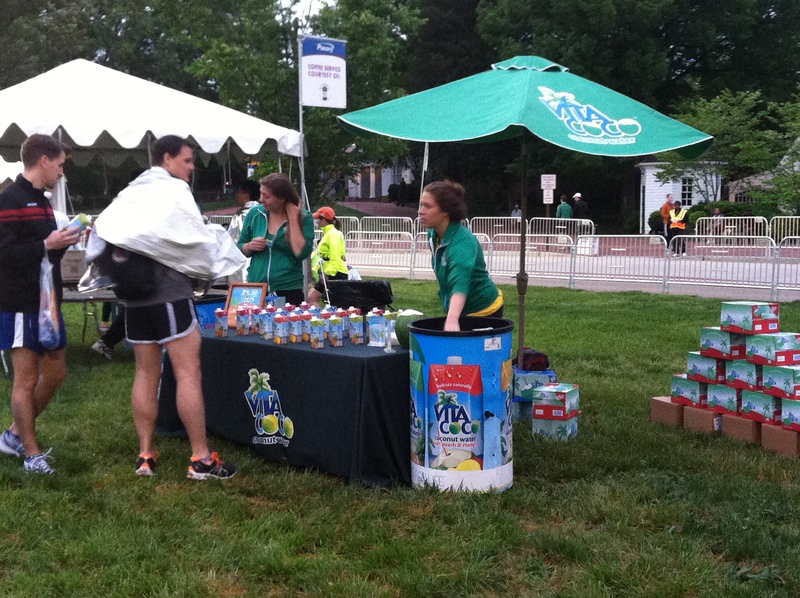 Food was available pre-race including free coconut water from the people of Vita Coco. FREE COFFEE!!!!! And that was great because it was cold / raining and I ❤ coffee. There were also space blankets, which were totally clutch because, as mentioned above, it was cold and raining. I personally won’t be deterred by rain, especially a light rain like Sunday. I just throw on a hat to keep the rain off my face and I am good to go. Luckily, Pacers had gear trucks, so I was able to keep my fleece on until 7:45 am when we checked our bag and made our way to our respective starting positions. Mike lined up in the 7 minute mile corral, and I lined up at the 10 minute mile corral. I was supposed to be taking this race “really easy” because my marathon is this weekend but, as I kind of expected, I couldn’t hold myself back! The road was totally closed for the race so there was plenty of space. Even though I lined up with a slower group, I quickly broke through to the 9:00 – 9:30 group. There were a shocking number of spectators out considering the weather, and that certainly helped me maintain my pace. Pacers had well stocked water / gatorade stations about every two miles with bathrooms (I didn’t stop, but the lines didn’t look awful). They also have a clock at every mile, which I think is a really great perk. I wear a Garmin Forerunner 210 so I know my pace / time, but, if I didn’t, I think this would be a very welcomed feature. The race felt like it flew by and, even though I was starting to feel a little tweak in my left hip flexor from all the hills, I managed to maintain my pace to cross the finish line in 1:32:30 (My previous 10-mile PR was 1:37:01 so… I basically killed it!). The post race festival was held on the water in Old Town Alexandria. I think we would have stayed longer if it wasn’t raining / cold because it was set up really well! There were bathrooms, water, gatorade, bagels, granola bars, and bananas (that, like all race bananas, needed another 5 days to ripen before I would consider eating them… but I’m weird about bananas). We even got a sugar cookie with a big green leaf on it because it was Earth Day! There was beer available too but we didn’t venture into that area. I occasionally enjoy a post-race beer, but we were heading to a beer tasting event that afternoon so I didn’t think a 10 am beer was necessary. 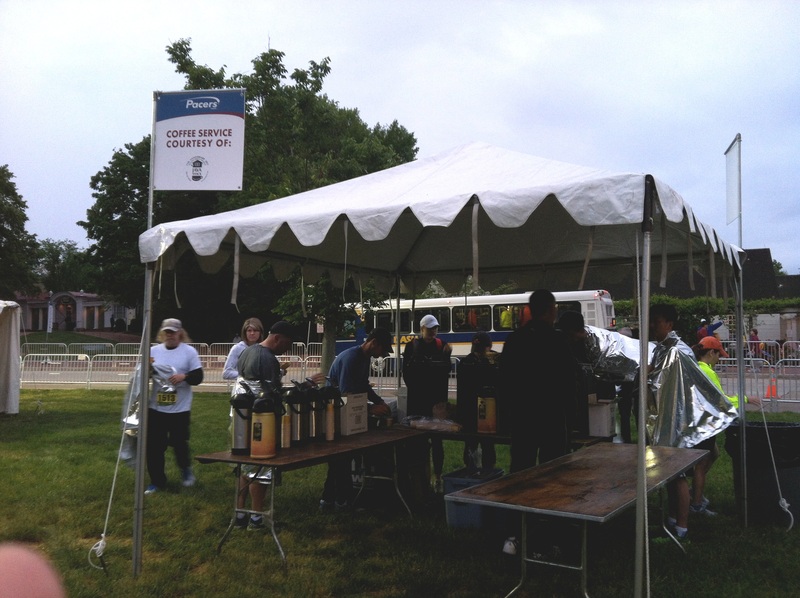 Run a Pacers event, you won’t be sorry! For those interested, Mike ran 1:07:41, just off his PR (which he set at the Cherry Blossom 10 Miler earlier this spring).